ONE OF THEM WAS R. P. Rithet, a great friend of the Dunsmuirs, whose home "Hollybank" was among the most gracious of Victoria mansions. "Hollybank" was built by Rithet in 1875. Rithet later became a mayor of Victoria and his firm Rithet Agencies Ltd. on Fort Street is one of the oldest real estate and insurance houses in Victoria. Rithet, like many of the merchants who became important socially had to wait a long time for prominence. He came here in 1862 and married Elizabeth Jane Munro, one of the three daughters of Hudson's Bay factor Alexander Munro. Rithet got his start here with Sproat & Company. Gilbert H.Sproat managed the lumber mills at Alberni in 1863 and built up a very large business with San Francisco and Victoria. In the last of the early gold rush years he shipped one million board feet of lumber to Victoria, so great was the demand for hotel, saloon and dwelling construction. To handle this business he established a commission house in Victoria under the name of Sproat & Company. This firm also handled commissions and insurance and Rithet was his right hand man. After the gold rushes Gilbert Sproat became discouraged with Alberni and maintained that the district was too rugged for profitable lumber operations. Present day Alberni proves him to have been an unreliable forecaster. Sproat Lake is named after him. Rithet left Victoria in 1869 to take charge of the San Francisco end of Sproat & Company's business and the Colonist bade him fulsome goodbyes. But they were rather premature. Rithet was back three years later and became partner in the firm of Welch, Rithet & Co. After being elected mayor in 1885 he entered politics and became M.L.A in 1889. He then went on to found his own whole­ ale house which prospered exceedingly in the Klondike gold rush of 1898. Rithet and other enterprising Victoria merchants were able to persuade tens of thousands of gold-fever-racked stampeders in Seattle and San Francisco that Victoria was the best point in which to buy supplies for the Klondike and the best port of embar­kation to the north. The Vancouver and Victoria boards of trade even advocated through brochures that gold-seekers go all the way to the Klondike via the Ashcroft trail and thence overland north. Very few, if any, who took this trail ever reached journey's end. During the Klondike gold rush the streets of Victoria were like a madhouse. To quote Pierre Berton's Klondike the city was "invaded by Scots, Irish, Germans, Australians, Americans, garbed in outlandish costumes and dragging oxen and horses along roadways piled high with sacks of provisions, knockdown boats, fur robes, etc." Our merchants did a roaring trade and the Klondike laid the foundation of many fortunes. Horses fit only for the glue factory were sold at outlandish prices. One ship the S.S. Bristol left here with 600 horses housed in 2-foot-wide stalls. It had to return it was so top heavy. But the accommodation for the gold-seekers was not much better and near riots broke out on many ships. Rithet built Rithet's wharves at Dallas and Simcoe Streets, later part of the site of V.M.D. shipyards, had a steamship named after him, developed a large fann and was a well-known horse fancier. "Hollybank" which sat on several acres facing Beacon Hill Park, had all the then accepted signs of success; stables, barns, tennis and croquet courts, a rose garden. Gertrude, a Rithet girl, married Laurence A. Genge, whose family lived next door at the corner of Humboldt and Vancouver. The former Genge home still stands and is now known as "Grant Manor." R.P Rithet died at Hollybank in 1919 and Mrs. Rithet lived there until her 100th year, dying in 1950. An iron fence from "Hollybank" is in the Legislative Square. Before the Genge's moved next door to "Hollybank," the Roman Catholic Bishop Lootens had a cottage there. The cottage was removed to make room for the Genge home and was located until recently at Io12 Pendergast Street. In the past few months it has been demolished to make room for the Barcelona Apartments. Bishop Lootens' cottage was transported on rollers, a process which took several days. Moving in this way over even a comparatively short distance often made a resident very difficult to find. He would be neither at his old or his new address. His home was somewhere between the two. If the weather was very bad a house could get stuck in a road and block it for weeks at a time. 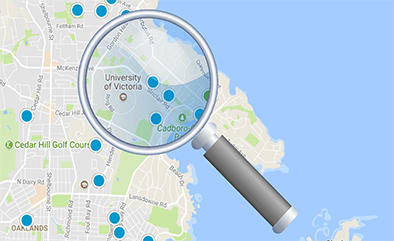 How recent is Victoria's history is illustrated by the fact that the late Premier Byron "Boss" Johnson as a boy helped his father remove the Lootens' cottage. Shotbolt, the druggist, whose store was on the south side of John­son Street, between Government Street and Oriental Alley, built a fine home called "Hollywood" on what is now known as Shotbolt Place. His store with its enormous glass flagons of presumably coloured water is now gone and a saw sharpening service and other businesses are on the site. Also gone are his home and 10 acre estate at Shotbolt Place. Many smaller houses are now on the site. Thomas Shotbolt like his contemporary Rithet waited a long time to achieve social recognition. He came to Victoria from England in 1863, was a leading merchant by 1880 and died aged 79 in 1922. In addition to his pharmacy business Thomas Shotbolt was one of the promoters of the street lighting and railway system and the turnabout for the Fairfield Road streetcar was outside his driveway near the Margaret Jenkins school. Rockland Ave, was a location of fine homes owned by many well known personalities. But fine homes were not confined to the Rockland Avenue area. Oak Bay obtained and still has a really fine home at 1587 York Place, built in 1898 by Charles Tupper, who is sometimes called the "Father of Confederation." Confederation is the offspring of so many so-called "fathers" that it must find its parentage rather confusing if not promiscuous. Charles Tupper was a Victoria lawyer who lived at the York Place home for nine years and then left for Vancouver. Charles Hayward, a pioneer carpenter who constructed the scaffolding for hangings on Bastion Street built his home on Vancouver Street. The site of this now demolished house is the parking lot on Meares Street opposite the Montreal Trust Building. The Hayward grandchildren were brought up in the still-standing green house at No. 1005 Cook Street (Rockland at Cook). The house for Victoria. He was a staunch supporter of the Anglican Church and once narrowly escaped death. He was helping to put out a fire in the loft of Christ Church when he fell through the plaster ceiling and would have continued to the floor if he had not been caught by the roof beams. He married a sister of Chartres Brew, Inspector of Police, and it is not unreasonable to assume that the marriage played a role in his selection for the post of police commissioner. Quite naturally, interrelated families in Victoria helped each other, the posts given to his kin by Sir James Douglas being an outstanding example. Augustus Pemberton met his future bride when at her brother's request he waited on her when she arrived by ship from England. It was a case of love at first sight and the couple walked hand in hand from Esquimalt to the city. They were married in 1861 and had three children - Chartres, Cecil and Evaline Mary; Evaline being the first registered nurse in Canada; she died in 1965. 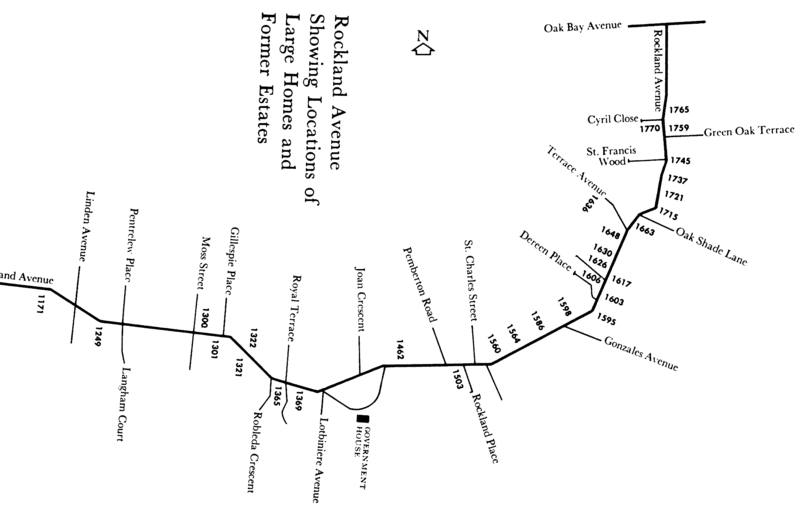 Rockland Avenue on which "Gonzales'' was built in 1895 began at St. Charles Street and continued northeast to what is now Oak Bay Avenue. From St. Charles Street west what is now Rockland Avenue was called Belcher Street. The oldest still standing home on what was then Belcher Street is "Duvals" (now 1462 Rockland) opposite Government House. It was built by Mrs. Elizabeth Miles in 1860. She was a very capable woman. Her husband, a government official, died two days after their marriage. Later she bought Government House ( Cary Castle as it was then known) and sold it to Royal Governor Kennedy. Still later "Duvals" belonged to Chief Justice Joseph Needham and was bought in 1870 by Francis J. Barnard who had made a lot of money with his Cariboo Express Services during the gold rushes. He deserved to make money. He started his express service the hard way by personally carrying mail on his back and walking from one end of the Cariboo to the other. It was many months before he got the government mail contract. His son Harry became an M.L.A. and senator and died in "Duvals" in 1954. In spite of the fact that a minimum suburban lot had to be five acres in extent, the property was not large and the grounds extended only 200 feet back from Rockland (Belcher) between Joan Crescent and Pemberton Road. Craigdarroch Castle grounds seem to have jutted into the "Duvals" property because the railings round the old Craigdarroch lodge can still be seen between the "Duvals" driveway entrance and Joan Crescent. A few hundred feet northeast of "Duvals" is "The Priory." This house is at 729 Pemberton Avenue and the five-acre grounds were once bounded by Angus Road in the north, Rockland, Pemberton and St. Charles. It was built in 1885 by the Hon. E. G. Prior, coal mine inspector, businessman ( Prior's Hardware Store), militia colonel, premier and lieutenant-governor. Prior's first wife was Suzette, youngest of John Work's daughters. The land between "Duvals" and Fort Street belonged to biscuitmanufacturer Samuel Nesbitt, the site of whose residence has been a vacant lot since it burned down in 1960. Carberry Gardens off Fort Street formed the driveway to Nesbitt's home, "Erin Hall," ( see index) . Nearby in Regent's Place is the former home of David W. Higgins, the journalist-politician-businessman whose career is outlined elsewhere ( see index). The house at Fort and St. Charles Street is now being renovated and is evidence of the considerable progress Higgins made since pitching his tent on Douglas Street in 1858 and sending his contributions to the British Colonist for which he worked on a free-lance basis. But fine homes were not confined to the Rockland Avenue area. Oak Bay obtained and still has a really fine home at 1587 York Place, built in 1898 by Charles Tupper, who is sometimes called the "Father of Confederation." Confederation is the offspring of so many so-called "fathers" that it must find its parentage rather confusing if not promiscuous. Charles Tupper was a Victoria lawyer who lived at the York Place home for nine years and then left for Vancouver. Charles Hayward, a pioneer carpenter who constructed the scaffolding for hangings on Bastion Street built his home on Vancouver Street. The site of this now demolished house is the parking lot on Meares Street opposite the Montreal Trust Building. The Hayward grandchildren were brought up in the still-standing green house at No. 1005 Cook Street (Rockland at Cook). The housewas noted for its spiral staircase ... very rare at the time it was built. The home is now used by the Roman Catholic Church as a recreation center, or was until recently. From scaffolding and its victims to the undertaker business was a logical step and Hayward's Funeral Chapel, of which his grandson is a director, was founded by him. C. E. Pooley, one-time Court Registrar and then Speaker of the House, lawyer, and confidant of Robert Dunsmuir, built "Fernhill" at Lampson and Esquimalt. A short distance away was "Ferniehirst" built in the 1860's by Robert Ker from Dalkeith, Scotland, father of David Russell who was partner in the great Brackman-Ker milling complex and founded the family fortunes. "Ferniehirst" stood in 150 acres of land bounded by the Colquitz River in the north, the Gorge ( then known as The Arm) in the south, Portage Inlet in the west and Tillicum Road. Tillicum was the boundary between the Ker and the James Yates properties. "Clahowa Tillicum" means in Indian talk "How do you do, friend?" Yates and Ker used to greet each other over the boundary fence with "Clahowa Tillicum?" and as a result when the road replaced the fence it was called Tillicum. Ker Avenue was the approximate site of "Ferniehirst" and nearby roads Davida Street, Inez Drive, Arnot Drive and Walter Avenue perpetuate Ker family names. Pioneer Robert Ker, several of whose descendants live here today, met his death in an unusual manner. There was a terrific snowstorm on New Year's Day 1879. Robert Ker left on horseback late in the evening for the Gorge Hotel. He never came back and was found dead in the snow the next morning. There is a brass plaque in his memory in St. John's Church of which he was a pioneer member. He was successively auditor-general and paymaster general, being retired on pension after Confederation together with many other officials. He had been 14 years in government service. Douglas Street near what is now called the Fountain or Humber Green was another favored residential area. Henry Heisterman, who started Victoria's first library after he failed to find gold in the Cariboo, built a fine home where the Scott Block now is. He built up a big business in real estate and insurance. Nearby was the finerococco home of the Erb (brewing) family and the homes of Noel Shakespeare (2663 Blanshard), mayor and postmaster, Theo Davie and Roderick Finlayson and round the corner at Hillside Farm, Mrs. John Work. Ludwig Emil Erb owned the Victoria-Phoenix Brewery and his wife was a great entertainer considering 200 guests a modest gathering. Today's Labatt's Brewery on Government Street is successor to Victoria-Phoenix Brewery. Captain Victor Jacobsen, the sealing captain, an industry which poured money into Victoria, built his home at 507 Head Street, Esquimalt. It was extensively restored by its owner in 1969. At first he decried and hated Victoria, but grew to love the city so much that he later lived here. Robson was one of 16 children and came to British Columbia to look for gold, found none and gained a living splitting shingles. He then turned to newspaper work. As editor of the British Columbian he was very anti-Douglas, blew hot and cold on Confederation and was knocked down and severely hurt by a political opponent. As later editor of the Colonist he got $250 a month, but doubled his emoluments when he obtained the post of paymaster and purveyor to the Canadian Pacific Railway Company ... a post which was declared superfluous after four years. He is buried in Ross Bay Cemetery. In the Esquimalt neighbourhood, the "Dingle House" ( originally called "The Dingle") on Gorge Road which is now the Redwood Park Motel was built by Charles W. "Gasworks" Thomson, a rugged 200-pounder who could smell money as a camel smells water. Thomson's first break came when his ship while rounding the Horn was blown off course in 1859 and made a landfall in an area where there was an abundance of mules. He found when he arrived in Victoria that the Fraser River gold rush was causing an unprecedented demand for pack animals. Thomson imported mules, broke them in himself on Wharf Street and shipped them to the Cariboo. He then went into the fish business and turned also to farming. He was, in addition, a big realtor and rancher, saw money in gas and in 1862 was made secretary of the Victoria Gas Co. He also found time to import pheasants from Mongolia and thousands of their progeny now breed in the Victoria neighbourhood. Thomson built Dingle House in 10 acres of land in 1880 and it was one of the show houses of its time. While it was building he lived in "Maplebank," now part of the Yarrow's Shipyard. He died in the Dingle House in 1916. A near neighbour of Thomson was Sir Frank Barnard who lived just beyond the Johnson Street Bridge in "Clovelly." "Clovelly" was built by A. J. Brideman in 1894 and purchased by Sir Frank in 1899. The Barnards were a family to be reckoned with in Victoria, Sir Frank being brother of George Harry (Senator) Barnard who was mayor of Victoria 1904-05 and in that capacity helped to get the Empress Hotel built. Sir Frank became lieutenant-governor at the outbreak of World War I and suffered some embarrassment as a result. Mrs. Frank Barnard was a Loewen of German extraction, and threatened demonstrations against her following the sinking of the Lusitania led to the posting of military patrols around Government House. The driveway to "Clovelly" was what is now Barnard Street off Esquimalt Road. The Loewen girls all married remarkably well. Joseph Loewen built a brewing empire here with a fellow immigrant from Germany, Ludwig Erb (Loewen & Erb) and his six daughters married into the Barnard, Pooley, Prior, Arthur, Jones (realtor), H. M. Robertson and Rogers families. Young Rogers from New York had a letter of introduction to James Angus in Victoria. Angus was brother of the C.P.R. president and through him Rogers discovered that sugar imported from Fiji could compete successfully with the Honolulu product. The discovery sweetened the lives and bank accounts of both men considerably and laid the foundations of the Rogers' sugar fortune. The fine homes of the well-to-do coincided with the acceptance of the mercantile community as part of the fashionable world. No longer did Hudson's Bay Company officials, landowners and imported clerics and officials rule the roost. They still had status and were welcomed, of course, but the social leaders were the previously "not in" trading classes. We see this in the list of those present to greet Sir Edmund Barton, Australia's prime minister, when he arrived in 1902. On hand were E. G. Prior, Premier and hardware merchant; Chas Hayward, mayor and funeral director; L. G. McQuade, ship chandler; E. G. McPhillips, lawyer, David Russell Ker, miller, A. E. McPhillips, lawyer, and R. P. Rithet, shipping and sugar merchant and former mayor. We see the leading businessmen again to the fore at the funeral of Henry F. Heisterman in 1896 ... not a single Hudson's Bay Company representative or government official honoured as pallbearers who included : R. P. Rithet, Thomas Shotbolt (druggist) , C. E. Renouf, broker and merchant who came here from the Channel Islands in 1879 and was a partner in Nicholles & Renouf, hardware merchants; and R. B. McMicking, director of the telephone company. These instances of the dominance of the mercantile community can be multiplied in the social calendars of the period. For instance the committee formed for the opening of the Mount Baker Hotel in 1893 were all lawyers, politicians, doctors and businessmen. On the committee were: David Higgins, publisher, H. D. Helmcken, J. S. Yates, R. Jones, W. H. Langley, barrister, Allan Cameron, C.P.R. agent; Arthur G. Smith, barrister and H. B. Haines, an official of the Bank of British Columbia. The splendid Mount Baker Hotel on 10 acres of grounds on the Oak Bay waterfront had genial Joseph Virtue, former manager of the Hotel Vancouver as host. It was located near the comer of Currie Road and Beach Drive and the grounds stretched well beyond Orchard Street. The old Oak Bay Boathouse, demolished to make room for the present Oak Bay Marina, was near the front entrance to the Mount Baker Hotel and belonged to the Hotel. The Hotel had a short and financially not too happy life until it burned down in 1902. One reason for its lack of success was that it was too far from town in the pre-automobile age. The period of the Mount Baker Hotel probably marked the apex of the fortunes of the mercantile community of Victoria. Politics and business, industry and mining promotion, construction and the lawyer fraternity were all booming. The wealth of the province was funnelled into Victoria. There was no income tax and assessments on property were low. Victoria was a rich man's paradise and offered distinct advantages to "those of lesser breeds." The large homes and gardens provided employment for gardeners, landscapers, furnishers and carpenters, stone masons, French polishers, carriage builders and many other trades. One firm on Broad Street employed 14 carpenters who could make anything from a cabinet to a staircase and catered exclusively to owners of large homes.